Every thrift shop in the world seems to be packed full of lost, stand-alone teacups that don’t match with any set, but are still amazingly beautiful and deserving of some love. Turning them into candles gives them a new life as pretty, inexpensive tabletop decorations that are just perfect for dining outdoors on balmy summer evenings. They don't take much time and effort to make, and are also great as birthday, baby shower, and hostess gifts. Follow our easy tutorial ahead to learn how you can make a few of your own this weekend. Wax (we recommend soy wax because it burns without smoke, but you can also use paraffin or beeswax). This is also a great opportunity to use up old candle stubs. Tape two wooden skewers together at either end so they look like a pair of chopsticks stuck together. This is your wick support. You’ll notice that the wicks have little metal disks at one end: those will go at the bottom of the teacup, while the opposite end will be drawn between the wooden skewers to support it vertically. Lay the skewers across the teacup so the wick is centered inside the cup, with the string part drawn up nice and straight, perpendicular to the bottom. If you have trouble keeping the bottom of the wick in place, you can always fasten it there with a drop of crazy glue. 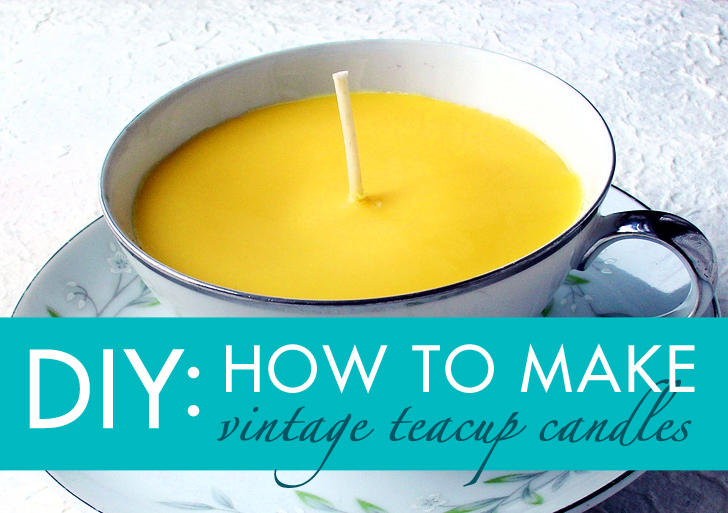 Add your wax to the smaller pot of your double-boiler (on in a can set within a pot of water) on medium-high heat. Chopping or grating it ahead of time will speed the melting process, and is recommended for even melting. If you use paraffin wax, feel free to add in some grated or chopped crayon pieces to add color to the candle in place of candle dye. While your wax is still nice and liquid, pour it into the prepared teacups, leaving ½ an inch of space from the lip of the cup. Allow this to cool completely (4-6 hours is ideal), then trim your wicks to 1 inch in length, and voila! 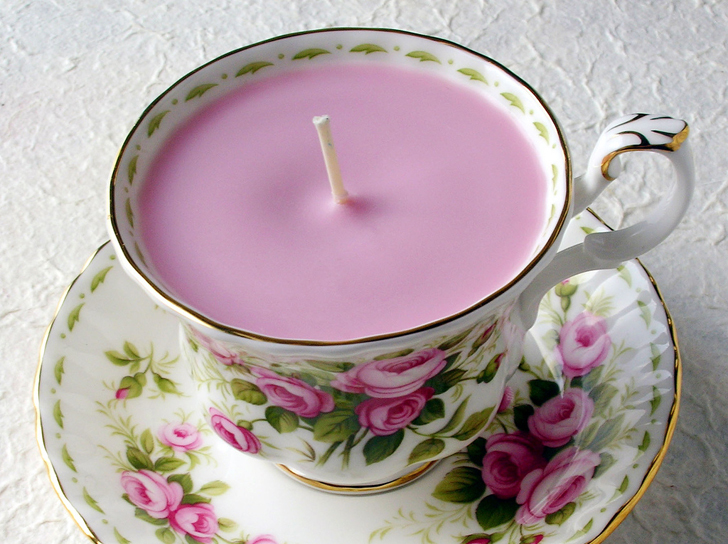 You have beautiful, handmade teacup candles to give as gifts. These are so pretty. I found a lovely set last week in a thrift store and plan to make it into a centerpiece for Easter dinner this weekend. I'm hoping to make these as favors for my neice's wedding shower! Tape two wooden skewers together at either end so they look like a pair of chopsticks stuck together. This is your wick support. You’ll notice that the wicks have little metal disks at one end: those will go at the bottom of the teacup, while the opposite end will be drawn between the wooden skewers to support it vertically. 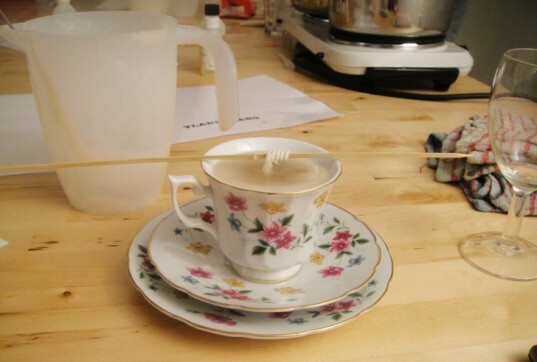 Lay the skewers across the teacup so the wick is centered inside the cup, with the string part drawn up nice and straight, perpendicular to the bottom. If you have trouble keeping the bottom of the wick in place, you can always fasten it there with a drop of crazy glue.